Refresh their memory! Our 24 oz. 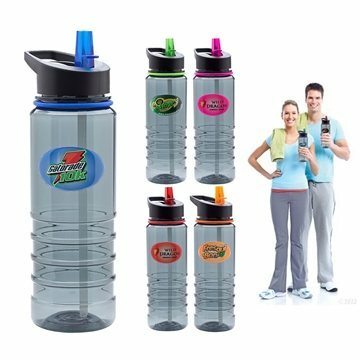 sports bottle is made from shatter-resistant tritan and features a spill resistant, screw on lid with a spout that flips open and is connected to a straw inside the bottle. Plus, it's BPA free and FDA and CA Prop 65 approved. A great promotional giveaway at tradeshows, marathons, athletic events, charity walks and community festivals, customize with an imprint and add some refreshment to your next marketing campaign. they all thought they were pretty neat and handy to have. Thanks! the embroidery was expertly completed. The service received during the entire process was outstanding. This was our third order and every time we are further impressed with AnyPromo. Quick turnaround time and the product looked great. the end product was as I expected it.